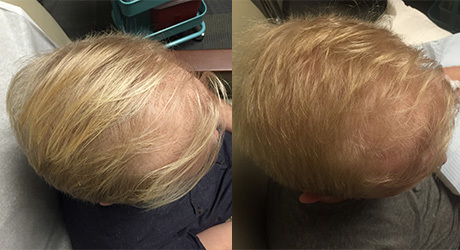 PRP Hair Restoration is a non-invasive, natural treatment for thinning hair. Once injected into the scalp, PRP releases growth factors which increase circulation to the hair follicle and activates the growth phase (anagen) of the hair cycle, while turning down the shedding phase (telogen). PRP has been shown to increase hair thickness and number of hair follicles. It can be used for hair loss secondary to a variety of causes including aging, hormones, nutritional deficits and chronic disease. It is most effective when the underlying cause of the hair loss is concurrently addressed- please consult with your FoRM physician or other doctor about addressing the root cause of your hair loss.. The steady progression of my hair thinning has stopped. PRP really works! I love that my hair is getting thicker and thicker, PRP is a great solution to hair loss. Dr Kai is very professional and makes you feel at ease. I'm really glad I made the choice to have PRP treatments. A: PRP contains growth factors which stimulates proliferation of cells. When injected into the scalp, this effect activates the growth (anagen) phase and turns down the shedding (telogen) phase of the hair cycle. Studies have shown that PRP increases both the number of active follicles as well as hair thickness.